How to unleash the hidden energy within you? Description of "How to unleash the hidden energy within you?" 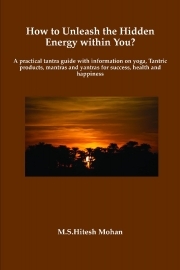 This is a practical book of tantra and yoga which provides detailed method of how to awaken your internal energy for getting health, wealth, success and happiness in life. The book also provides proven techniques for the cure of various diseases like blood pressure, obesity, diabetes, allergy, asthma and thyroid problems etc. through yoga. The highlight of the book is the information provided in the book about various tantra products, mantras and yantras which will found very useful for quick solutions to mental, health and wealth related problems of daily life. A must read book for everyone looking for a happy and successful life. M.S.Hitesh Mohan is an engineer turned author, motivator, social reformist and spiritual guru and founder of ‘Mission of Universal Happiness’. He is an ardent practitioner of Tantra and Yoga and has helped many in their pursuit towards health, wealth, success and happiness. He is also an eloquent orator and is at present engaged in delivering God’s and Nature’s message for happiness and success. As a spiritual guru he gives spiritual solutions to the followers of ‘Mission for Universal Happiness’ and all those who approach him to alleviate their sufferings. He has also written two books ‘How to unleash the hidden energy within you?’ and ‘How to cure diseases with Sunlight and Sunlight Therapy?’. Also watch out his upcoming book ‘God’s prescription for happiness’. Reviews of "How to unleash the hidden energy within you?"